Secure Home Warranty is a newer company in comparison to their competition, but they offer a tailored approach to home warranties that is not seen in many of the other home warranty providers. Secure Home Warranty offers home warranty services to homeowners, people involved in real estate transactions, multiple-property owners, rental property owners and realtors. Their packaging options are much different than most other home warranty companies. Coverage options and costs vary depending upon location and are specific to each unique need, so consumers have to get a personalized quote by calling Secure Home Warranty or by filling out a form online. All packages come with a 30-day guarantee. Homeowners can choose from an à la carte menu of options that allows them to pick and choose the items they want to cover. This makes sense, and allows the consumer to purchase coverage only for the appliances they own. This flexibility is rare in the home warranty industry. Buyers and Seller, Rental Property Owner, Realtor and Multiple Property Owner plans are more structured, but do allow for customization with optional coverage. The Appliance Plan includes the clothes washer and dryer, garbage disposal, refrigerator, stove/oven, built-in microwave, cooktop and dishwasher. The Core Plan includes the heating system, water heater, plumbing system, ductwork, air conditioning system and electrical system. The Elite Plan combines the two, plus adds coverage for ceiling fans. Consumers can choose add-on coverage for pools and spas, central vacuums, a second refrigerator, sump and well pumps, roof leaks, stand alone freezers, sprinkler systems, septic systems, in-refrigerator ice makers, lighting and plumbing fixtures, and additional air condition units, furnaces and water heaters. 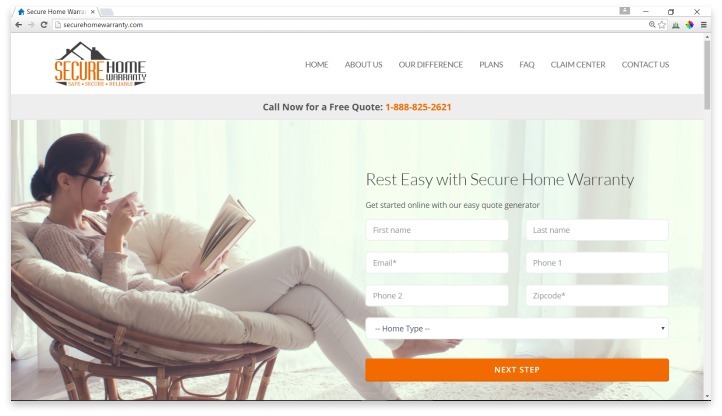 In order to make a claim, the policy holder can call the Secure Home Warranty claims center, which is available 24 hours a day, or log into the company’s online claim center. A Secure Home Warranty representative then arranges a contractor in their network to go to the customer’s home and make a diagnosis. At this time, the policy holder has to pay a service fee. Once diagnosed, Secure Home Warranty makes a decision about whether the broken item is covered, and then whether it should be repaired or replaced. As the company is brand new, in comparison with most other home warranty providers, it lacks a strong reputation. This is not to say they have a negative reputation, but that they barely have one at all. While the competition has thousands of consumer reviews online, Secure Home Warranty doesn’t have 25. This makes relying on these individual reviews very hard. Most of them are glowing, relaying lightning fast service for broken appliances, and qualified and kind contractors. However, there were complaints about lack of communication and payments due. Secure Home Warranty is a growing home warranty provider that offers customized plans and a few things other providers don’t. Secure Home Warranty is a growing home warranty provider. They offer a few things other providers don’t, like customized plans that take the consumer’s individual needs into account. Their lack of history, along with accessible reviews from real customers means consumers need to ask questions before securing their home warranty plan. For example, they may want to ask how many service technicians are available in their region, and how their quality is measured. With due diligence, Secure Home Warranty may be a great provider for many consumers, but it is too early to tell if they are reliable on a nationwide level. Have you had an experience with this company? Please share your Secure Home Warranty reviews below. I had an AC repair that they did not cover and even though the manager on duty agreed to go half in for, they sent me a reimbursement consent to sign they backed out of it. I went back to American Home Shield you really get what you pay for! - CONS: They hardly pay for anything you will be left holding the bag! Won’t cover any of the repairs needed. I have had two claims and either the part needed on the icemaker was not covered or the GE Profile cooktop is to old. They should tell you they are going to prorate all of your appliances before you purchase. Stay Away from them unless you like giving away your money and get nothing in return! - CONS: Finds a reason not to cover your appliances. on 6/19/17 i filed a claim because the ac went out which is covered under the warranty. It was looked at by the company that does the maintenance on it each year and was told it was the compressor gone bad. JLM Services came out which works for the warranty company on 06-22-17 and said it was the compressor gone bad. They said it needed to be replaced. They called the warranty company and they told them it was under review. I called a few hours later and expressed them how this needed to be fixed because it was 85 degrees in the house. my mom who lives here is on oxygen and has heart issues. They seemed not to care. I was put on hold by Jordan and after I a while he came back and told me it was not covered because it was electrical. I asked why were we paying for a warranty when they wont fix anything. He did not seem to care. he said he got the answer from Gordon Charles. I called back Rick for JLM Services and he said he does not know why they wont fix it because it is compressor which is gone bad inside. He said he would call them and call me back. A while later he called me back and said he called the warranty company and they wont fix the ac and he does not understand why. I paid jlm services 65.00 bucks for the ac being looked at and it got me no where. It seems that its like a scam to get your money each month and then not fix stuff when needed because they do not want to spend the money. Something smells bad here. - CONS: Takes money and does not fix issues.